The organisation of Aros de Esperanza currently consists of fifteen individuals: founder Guido Broekhuizen, Colombian project coordinator Andrea Giraldo, six female Colombian basketball coaches and seven female Colombian assistant coaches. The coaches Andrea and Claudia with whom Guido began the project in 2008 still form part of the organisation. Guido Broekhuizen is responsible for the overall supervision of the project. His tasks include: daily managing of the project, analysing and filing of the weekly reports of the coaches, accounting of the financial administration (including the salary administration), writing project proposals and PowerPoint presentations, writing monthly newsletters, maintaining the website (including writing news articles), establishing partnerships, attending meetings, conducting presentations and evaluating the project. Guido also trains the basketball teams of the neighbourhood El Jardín in the mean time that Aros de Esperanza is looking for a qualified Colombian female coach who can give the training sessions in this neighbourhood. Andrea in her job as project coordinator is amongst others responsible for monitoring the basketball training sessions, organising the league matches and Family Days, purchasing all the basketball materials and the physical payment of the salaries to the coaches. The coaches and assistants are responsible for the overall content of their basketball training sessions, for the coaching of their teams at matches and for the weekly communication with the parents of the girls (house visits). Photo staff Aros de Esperanza in Medellín, taken in 2010, still in the old uniform. Back row (coaches - from left to right): Claudia, Andrea, Karina, Guido, Amanda, Liliana. Front row (assistants - from left to right): Alejandra, Jesica, Anyuli, Leidys, Johana. On the photo are missing the new assistant coaches Maria, Johana and Sandy. Guido has been working in the sports for development sector since 1999 in the continents of Africa, Central America, Asia and South America. He has implemented projects in refugee camps, shanty towns and for street children in urban settings on behalf of: SCORE, Camino Seguro, War Child Netherlands, Right to Play and CDUC. Since the beginning, Guido experienced the enormous power that sport can have on children’s lives and the overall living conditions of the communities in which he served. All coaches of Aros de Esperanza are licensed Physical Education teachers, with a specialization in basketball, and were selected due to their adequate social pedagogic skills which require working with girls from disadvantaged neighbourhoods. A key task within Aros de Esperanza is to increase the commitment of the participating girls within the organisational structure. The girls will be encouraged to organise basketball and social activities within the project and to become the new leaders of Aros de Esperanza in the future. One aim for instance is that in the year 2015 at least eight players have to support the basketball coaches with giving the training sessions. In the years thereafter this will set them up to grow into the official position of assistant coach. 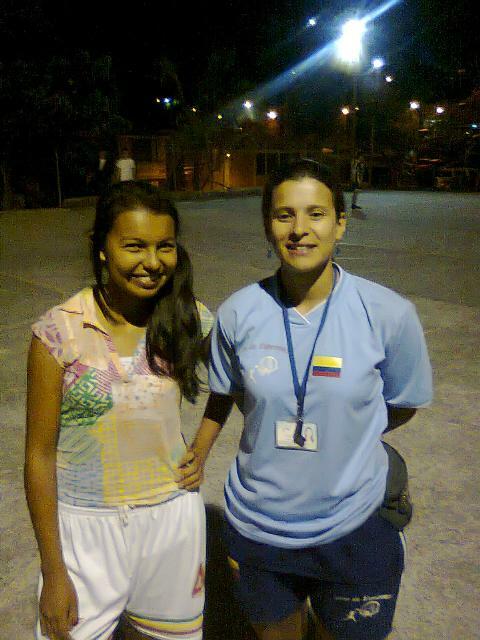 As of February 2012 we have already given our own player Luisa González an opportunity as assistant coach in our neighbourhood Hato Viejo. Luisa has been taken part in our basketball programme in Hato Viejo since the first day (May 1, 2008), so we are very pleased that she now can grow through our organisation. Aros de Esperanza also aims to get family members involved in the project as volunteers. The widening of the project programmes by including family members as volunteers will have a contribution to greater local participation and ownership in the neighbourhoods. Other community members living in the neighbourhoods will also recognise the place of Aros de Esperanza in the community by having the opportunity to benefit from the partnerships between Aros de Esperanza and social governmental community programmes, such as drugs and teen pregnancy prevention programmes.